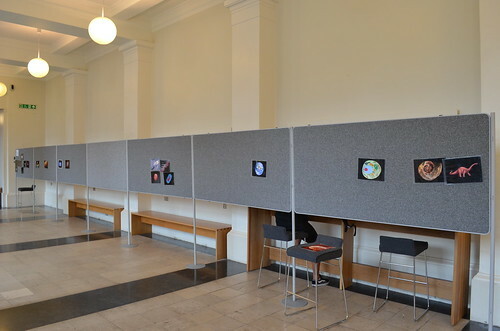 For three days in early October, the South Cloisters and Garden Room of UCL played host to a festival of astronomy – Your Universe. 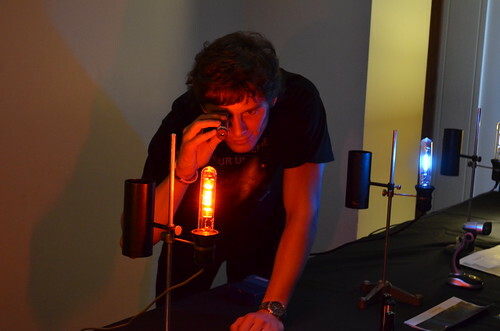 Organised by Francisco Diego and Farah Islam from the department of Physics and Astronomy, the event was divided into two school days and one Saturday for the general public. 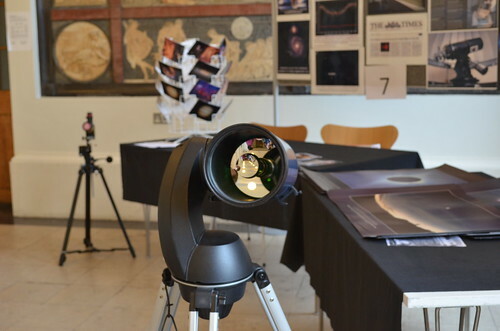 The events saw demonstrations and explanations of different aspects of astronomy delivered by researchers in the department as well as two lectures, one each on Friday and Saturday evening. The quiet and darkness of the Garden Room saw three presentations. 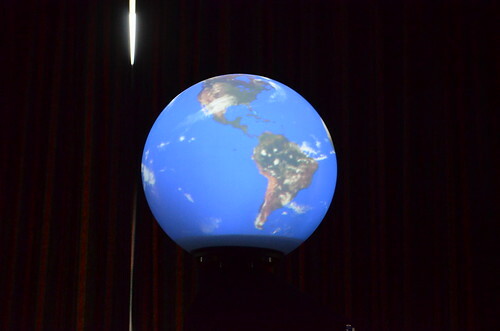 The first was a powerpoint presentation on exoplanets – planets orbiting stars other than our Sun – delivered by David Johnson. The second was the Magic Planet, a globe onto whose inner surface was projected the atmosphere or outer surface of the Sun, several planets and satellites in turn. 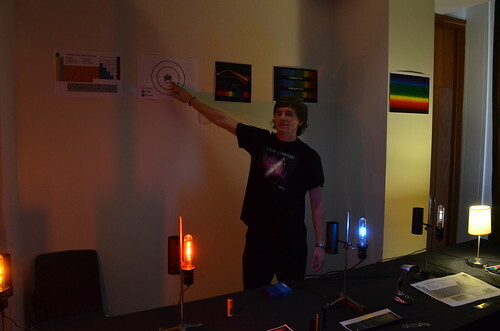 Finally, a demonstration of spectroscopy and the fingerprints of colours emitted and absorbed by individual elements was given by Gleb with lamps and spectroscopes capable of splitting light into the rainbow of available colours. In the South Cloisters, another five demonstrations lay in wait. 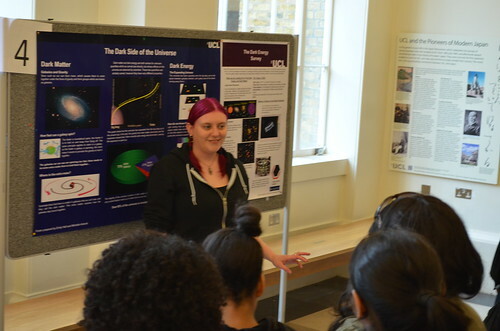 Firstly Emily Hall expanded minds with a talk on cosmology, discussing Dark Matter, that mysterious thing that interacts only gravitationally with normal matter, and Dark Energy; the curious driving force behind the expansion of the universe. 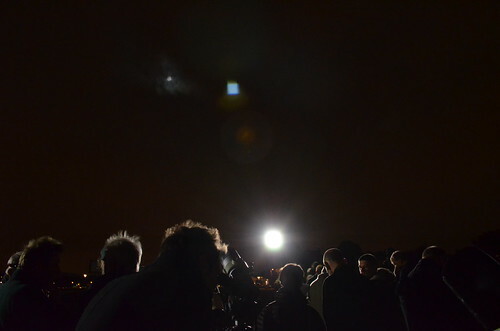 Next came a demonstration of robotic telescopes controlled over the internet from a NASA and Harvard maintained website. The third talk took in the life cycle of stars and an explanation of the HR diagram that astronomers use to categorise stars. 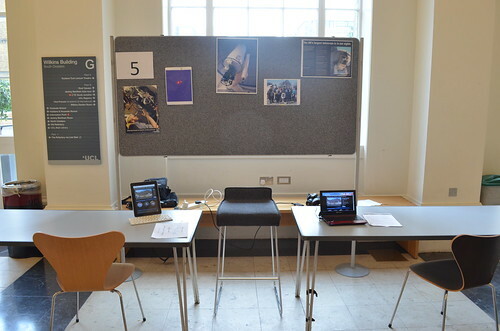 The fourth demonstration was telescopes, including scopes either looking at the Sun in the light of hydrogen atoms or, during less clement weather, at postcards at the other end of the South Cloisters, and a display on the University of London Observatory, used by UCL students studying astronomy. Finally, a demonstration of the timescales involved in the creation of life and the universe rounded off the main set of events. Outside of the main event, more sedate displays in the Octagon and North cloisters were within easy reach of guests. 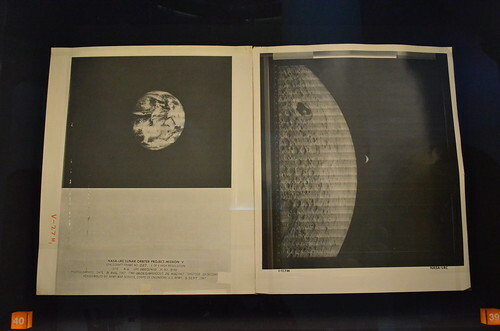 These included an orrery, showing the motions of planets and major satellites around the Sun and a book of satellite images open at plates showing the Earth and Moon as seen by Lunar Orbiter 5. 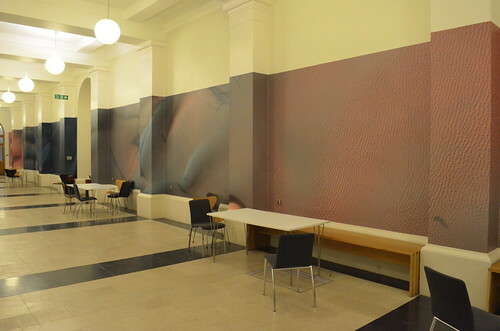 In the North Cloisters, the entire length of the space had been taken up by Pete Grindrod’s display; a high resolution image, ten miles of the surface of Mars as seen by the HiRISE camera on the MRO satellite, presently in orbit of the Red Planet. With eight groups of primary and eight secondary age pupils per day, we saw around five hundred school children pass through the displays during the first two days and more than another hundred members of the public on Saturday. 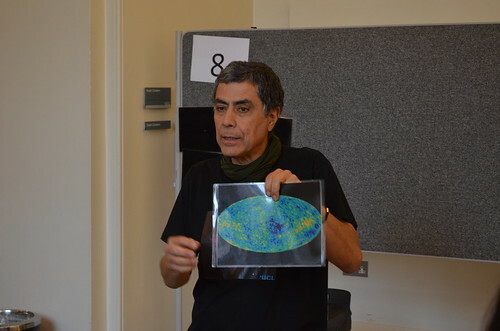 They also enjoyed two lectures; Mikako Matsuura’s description of seeing star birth through the eyes of the Herschel infrared space telescope and Francisco Diego’s answer to the question of why have we not found evidence of aliens. 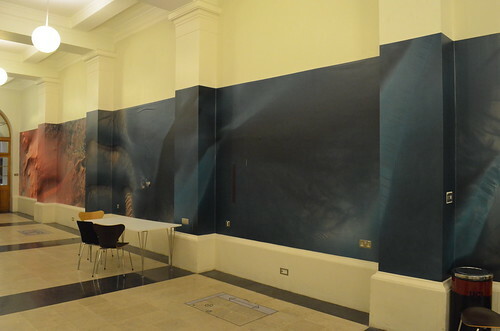 Further pictures can be found here. On the 18th of October 2013, three things came to pass over the darkened straits of Blackheath Common. Firstly, after a run of two perfectly clear nights and before another clear night, a pall of cloud descended on the location. Not so unusual, but rather frustrating as the second occurrence that night was to be a partial, or penumbral, eclipse of the Moon. 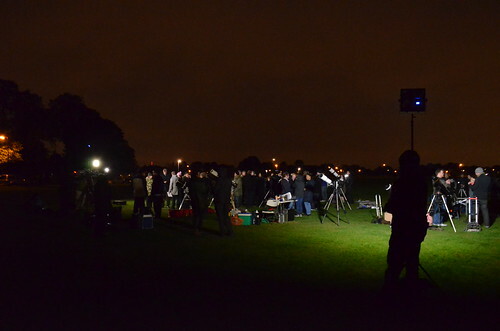 The third was the arrival of a gaggle of astronomers and friends hoping to be a part of the filming of an episode of the Sky at Night. Broadcast from 1957 to the present day, the Sky at Night has always represented an amateur astronomer’s eye view of the world of astrophysics and the skies above, passing on news, tips and tricks to improve knowledge as well as the quality of time spent looking into space. 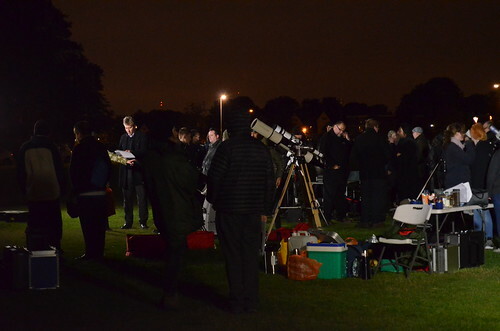 On this occasion, astronomers were donated to the cause by the nearby Flamsteed Astronomical Society as well as central London’s Baker Street Irregular Astronomers, of which I am a proud member. 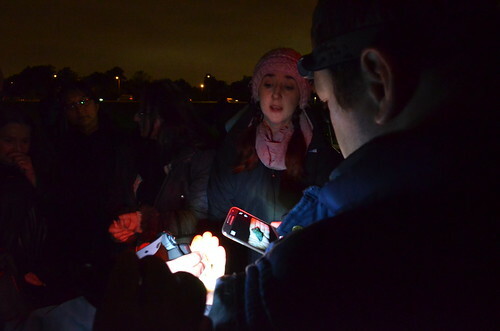 We were to gather on the heath near the parking area on Talbot Place at the appointed time of eight pm. News on the weather and whether or not we’d go ahead propagated through twitter from lunchtime with all groups saying ‘It looks bad, but not bad enough to cancel’. 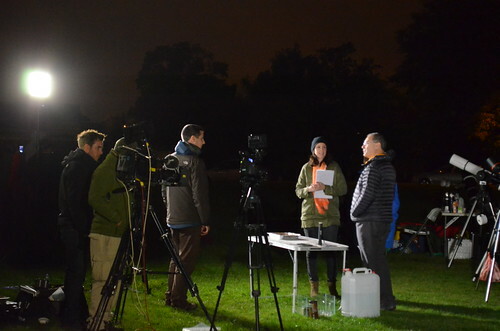 We had also heard that the Sky at Night team, fearful of being clouded and rained off were to film the majority of their program at the Royal Observatory, Greenwich, with brief appearances to watch us set up at eight and a visitation after the eclipse started at eleven. But that turned out to be incorrect – they were with us all night, having visited ROG for a few hours earlier in the day. 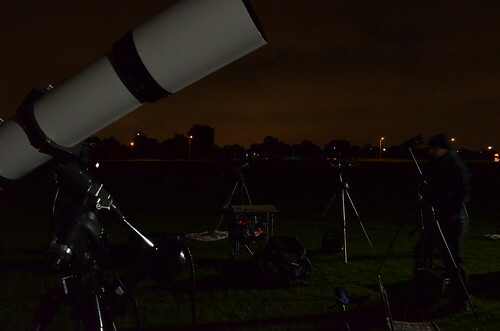 On arrival, I proudly set up my own scope, a 130mm newtonian by Celestron; a reflecting telescope that uses a mirror to bring the rays of light to a focus, based on a design by Newton. 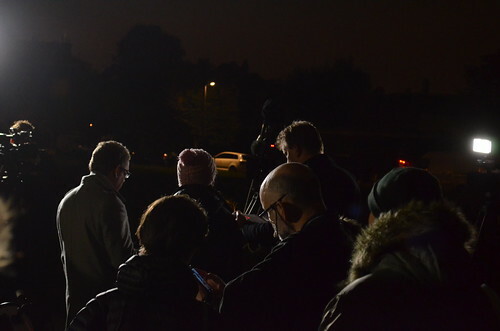 I had entered the heath, trundling my cases of equipment, and joined a rather obvious crowd of people illuminated by a few floodlights. Not the most subtle gathering on a darkened common on an autumnal evening. I checked everything was ok on the telescope. Although the thing had joined me observing in crowds and on photoshoots in everything from art centre gardens to the grounds of ruined castles without problems, it always makes sense to ensure you can see something through it before inviting anyone else for a look. 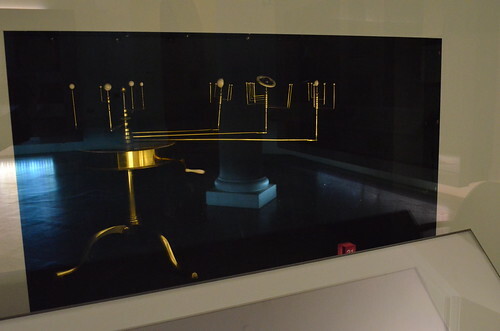 Fortunate that I did in this case as it appears the trundling of the case had loosened something – the primary mirror had seemingly slipped a little. No problem, just a quick twiddle with the collimation screws and it should realign into something like the right position. It didn’t. Instead there was a clunk as it choose to detach itself completely and have a rest in the body of the telescope. Somewhere in the darkness a spring also leapt to a new life in the grass of the common. Ever stoic, I decided to find someone in the crowd I was familiar with to complain to. I found a few fellow irregulars holidaying in Blackheath away from our usual meeting place at the Hub in Regent’s Park. They included Paul Hill and Tom Kerrs of the ruling Unofficial Force as well as Eric Emms and a considerable number of others who’d ventured into the unfamiliar terrain of South East London. I hadn’t even made it halfway through the crowd before a few friendly Flamsteed faces struck up conversations as well. 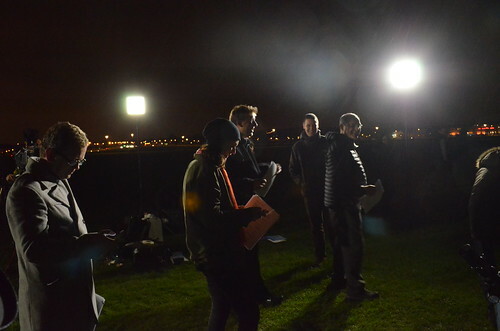 This was very much the tone of most of the evening, friendly conversations amongst the crowd while somewhere in the distance the Sky at Night team beavered away on the many shoots and reshoots required to get their scenes just so. At this point, interest at the back end of the crowd was more on what was happening above than the pieces to camera going on behind a dense wall of people in front. A couple of brief glimpses of the Moon later, I returned to the stricken scope. With the use of gravity and the light of a phone shone by a kindly guy in the crowd, the mirror was rotated back in place and the screws found in the bag returned to their preferred positions. A second, more successful collimation was followed by the ceremonial laying of a pink blanket just in case anything else should choose to take in the event from the comfort of the grass. As I was beginning this, I was greeted by the presenter Chris Lintott, a former UCL student like myself. I returned to the Irregulars in the crowd and we were soon joined by tonight’s Sky at Night special guest Katy Joy, another former UCL person. 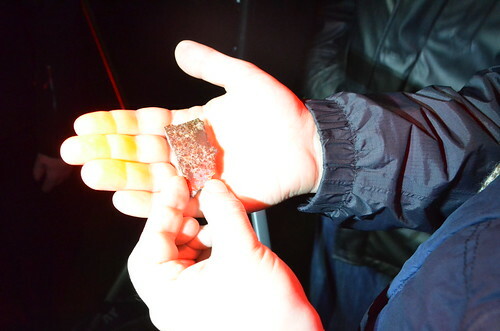 She brought with her a polished fragment from a carbonaceous chondrite meteorite as well as a tiny fragment of a Moon rock turned meteorite, kept in a protective plastic bottle. The meteorite was a survivor from the early solar system, containing materials that had never sat in an object so large as to differentiate the heavier from the lighter mass materials through the action of gravity. She spoke on the subject at length answering questions from the audience in depth, allowing us all time to hold the fragment and bottle and take our pictures while learning firsthand from a researcher in the area the meaning to science of these objects as well as their inherent interest on a more personal note. A very Sky at Night presentation and one she happily soldiered through repeatedly, going through the crowd bit by bit to get to as many people as possible. By ten pm the crowd had begun to thin as some of those from farther afield parts of London had to return to family and normal life. 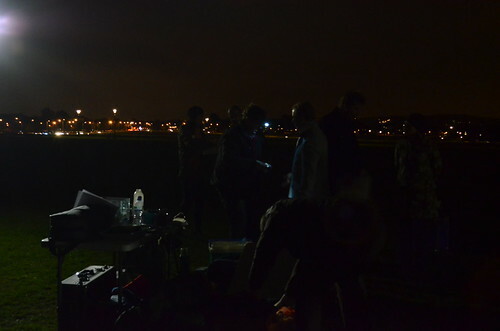 We were boosted by the late night dog walkers and a few clubbers diverted by the crowds. I also took some time to walk outside of the illuminated area and get photos of those on camera from behind the filming area. 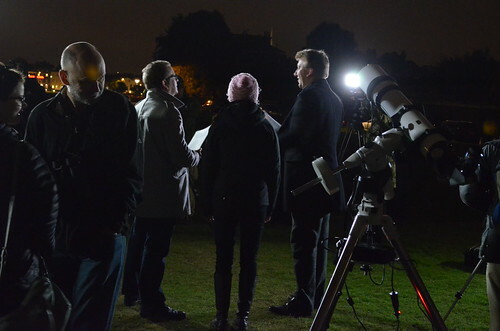 Back at my telescope to take advantage of some breaks in the crowd, I was joined again by Chris Lintott and Paul Hill for a more indepth chat while the cameras were working on scenes not requiring Chris’ input. At these moments, those not meant to be on camera are to remove themselves entirely – not to be seen or heard at all. I rather like the idea of the presenters and guests being seen to interact with the audience, but can see how it would be distracting. 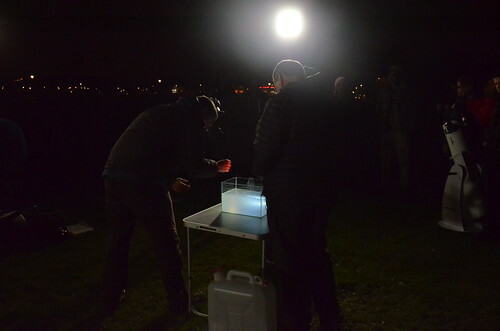 Other aspects of the filming process were also coming through as Pete Lawrence and Lucie Green attempted to demonstrate with models a lunar eclipse. The number of takes seemed to suggest this was being done on the actual timescale of planetary movements, but the result would be a minute or so, if that, of final screentime. Sounds coming from the presentation table included the presenters clapping before takes to give the soundman something to latch on to and the banging of a later crater creation demonstration. As the evening turned to night, further people crumbled away, including my small group of Irregulars. The hardy few of us remaining were moulded into a crack team of audience members by Jane, who brought people and telescopes forward to cover the cameras’ fields of view. 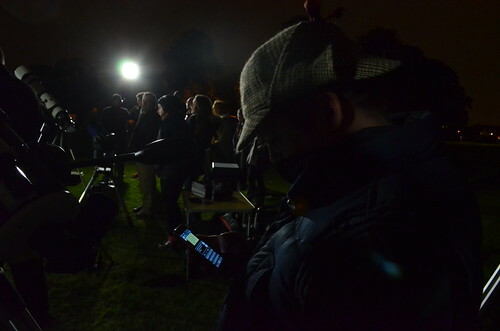 As my telescope and I were slotted into place, the team were in search of a balloon from a past demonstration. Another audience member and I caught sight of it making a bid for the busy road far in the distance. Too far to be saved, I’m afraid. 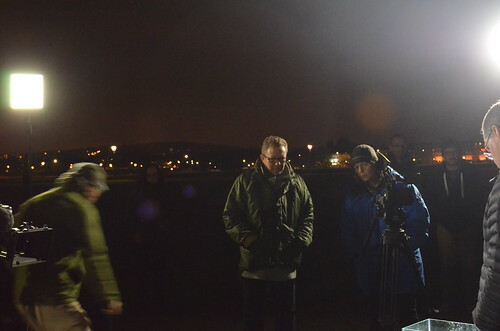 Two demonstrations remained to be filmed. The first was one I’d seen on a couple of documentaries recently, which was placing a few drops of milk in a tank of water to simulate particles in the atmosphere. 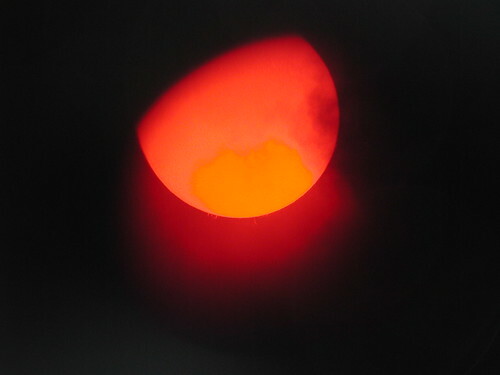 When illuminated by a white light torch, these would then show how particles in our own atmosphere preferentially scatter bluer light, leaving the redder light of the Sun, as we see at sunset, or as is projected onto the Moon during more complete eclipses. Milk in tank, torched shines through sounds simple enough. However, a large group of people standing on Blackheath Common after a few hours near no public toilets while a tank is being ever so slowly filled with water can make things more complicated. Worse when the first attempt sees too much milk added and the tank has to be emptied and refilled. Eventually, under the careful gaze of researcher (and another UCL guy) Will Gater, the right amount of milk was added and (UCL researcher) Lucie Green was able to carry on. I also noticed during this time how active the impressionist Jon Culshaw, another presenter, was behind the camera; constantly scoping out angles and passing on findings. Seeing him present, it is perhaps easy to forget he had his own show with I’d assume far more control over how that was shot. The second demonstration saw Lucie bring out a tangle of foil ribbon and a small portable Van der Graaf generator. To replicate the conditions seen by the Apollo astronauts when fountains of dust erupted from newly sunlit areas, the foil was to act as a particle of dust, become charged and levitate above the generator. One thing the Apollo astronauts didn’t encounter on the Moon was a strong gust of wind and I was soon handing an escaped tangle of foil back to Lucie. The next two attempts saw the tangle land in the hands of people either side of me, with the second one seeing the foil untangle and levitate for a short while before its bid for freedom. Just as they had decided to abandon the effort, with the first drops of rain starting to send astronomers heading for their lens caps, the wind dropped. Finally we saw the tangle of foil unravel itself into a three dimensional figure of eight shape and hover above the generator for an appreciable length of time before again making its way into the crowd, followed by Lucie and her wand like device. Those behind the camera thought all this amusing enough for the take to be declared done, for which a round of applause was given. Finally, all the presenters were brought out of perdu for the final goodbye to camera. They were given their crib notes. final decisions on who was to say what made and final discussions on the script. Chris was a little reticent to state it was 1 am and the time of maximum eclipse as the intended audience would likely know maximum eclipse was ten minutes earlier. Outvoted, he used the version given to him and each presenter went through their bit. Then a few more takes and retakes before the cameras were turned on the crowd for our rictus grins. 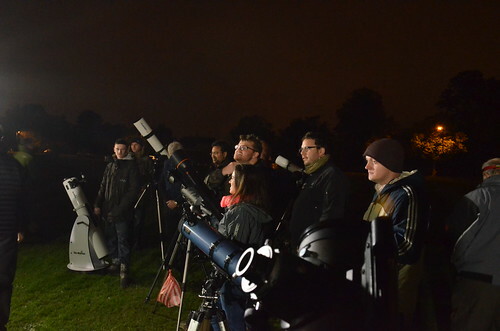 The smiles of people ignoring the rain beating down on equipment stretching from the hundreds to the thousands of pounds worth of telescope in support of a program that had probably sustained them through darker nights when developing their own love of what can be a very solitary hobby without the warmth of an observing group. Rictus grins over the signal was given for us all to pack up and out of the rain. Pete came round to say thank you to everyone he could find and Will Gater also came over to say hello, recognising me from twitter. 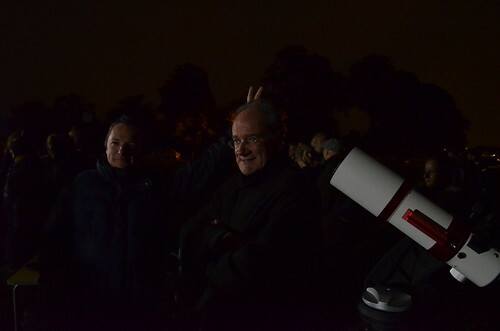 There had been another guy who recognised me from meeting at astrofest but it is quite a feat to recognise me from a twitter avatar even in daylight. And with that, the night was over. The Sky at Night team had their hotel to return to whilst the rest of us tidied away our stuff and made our way back to our various homes. Happy to have given something back to a program that has given so much over the decades it has been broadcast while asking for little in return. Having survived graveyard slots and the loss of its iconic first presenter, Sir Patrick Moore, the Sky at Night faces review by the end of this year. Representing only 20 minutes a month (plus one repeat and a 30 minute special on BBC4), the Sky at Night bridges the gap between the more cerebral documentaries exploring the academic world of science and those aspects of astronomy available to the man in the street. At a time when interest in astronomy has never been greater, when the UK’s satellite information services sector remains the only sector to have not only grown but grown fast at every point in the economic downturn, now is not the time to switch off what for some may be the only thing nurturing the germ of an interest in the subject. There is no information on what the review may mean – it could well be a standard annual review of the program or it could be something more serious – but whatever the reasons, it doesn’t hurt to show an appreciation of the program by signing the online petition to keep it running. 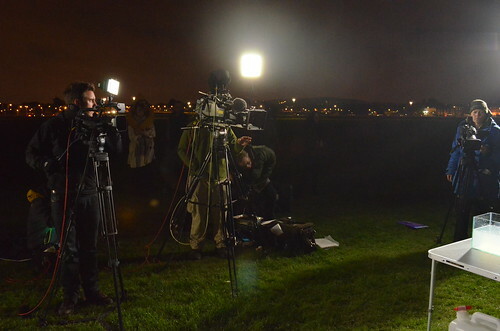 I wouldn’t like others to be denied the chance to experience a little bit of TV magic on a cold, blustery night on Blackheath Common. Full set of my images here. Imagine you’re looking out onto a canal and see two insects on the surface of the water. Their weight presses down and causes a dip into which anything rolling on the surface could fall in towards them. This is how mass creates gravitational attraction by curving space-time – the bigger the insect, the larger the dip and the stronger the gravity. Now imagine the insects are moving about or spinning around. They can create small ripples on the water. Each ripple is like a small dip travelling out from the middle. Anything on the water’s surface the ripple passes under will be jiggled about, falling into the dips and pushed out by the peaks of the ripples. Space-time is a lot more rigid and the ripples a lot smaller, but it is that jiggling that missions like LISA are looking for. The ringed planet Saturn is at opposition – ie it is at the part of its orbit that brings it closest to the Earth. This in turn makes it a good time to have a look at this most stunning planet. 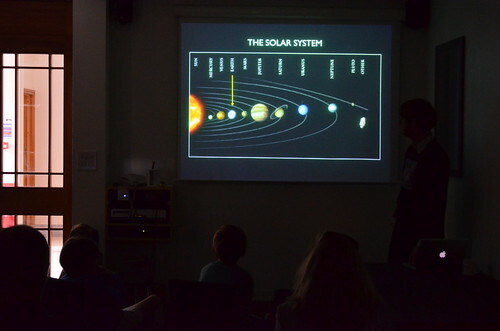 Global Astronomy Month has also begun and they started things off with a live view of Saturn. For those wanting to look at how the professionals do it, Tom Stallard and Henrik Melin of Leicester University are presently stuck up Mauna Kea in Hawaii measuring the aurora with the Infrared Telescope Facility and have also put that online. They’ve blogged about what they’re doing here and will be broadcasting 11am-5pm BST every day of their observations at this page. 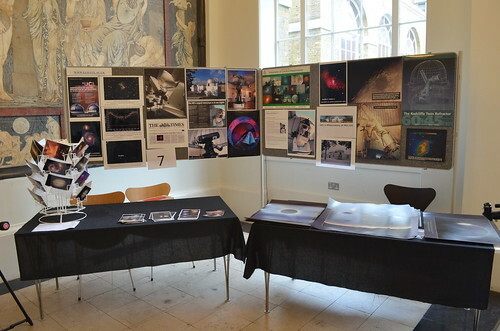 Max Alexander, the photographer behind the Explorers of the Universe exhibition has been featured in a blog entry for the Royal Observatory Greenwich site. 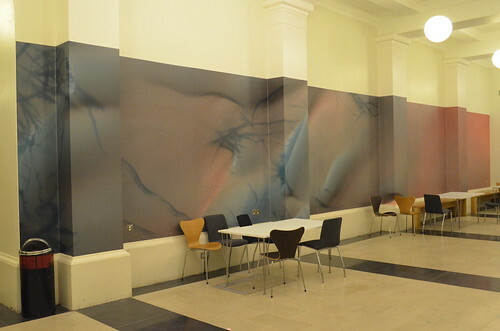 The entry includes a photograph of two auroral filaments (paths taken by the impacting electrons) intertwined by the complex electromagnetic interactions of the involved currents. The entry signs off with an infrared image of Saturn’s aurora, featured in the ROG’s new planetarium show Meet the Neighbours. We’re moving into the darker, colder and usually rather cloudy nights of the end of the year. As ever, this post is illustrated with a few sky charts showing midnight on the first, last and fifteenth day of the month. The dots represent brighter stars, green circles are star clusters, nebulae, galaxies and the like and the very brightest stars, the Moon and the planets are named when they appear. 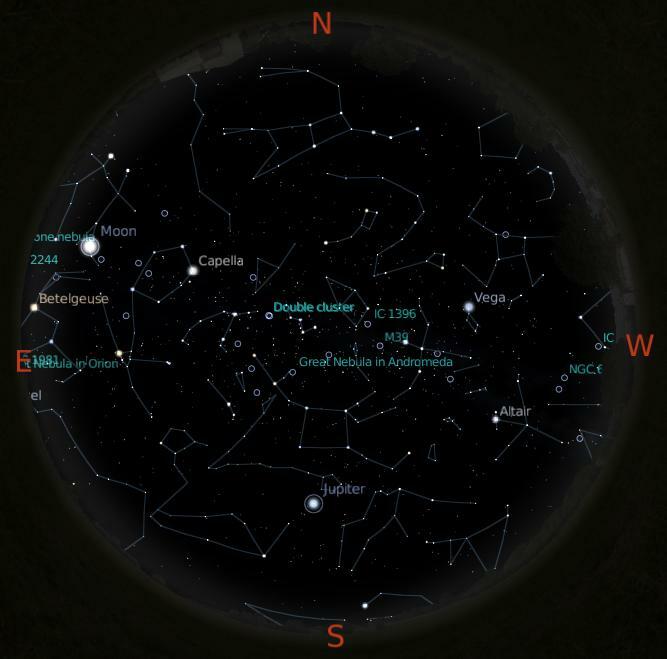 Sky charts provided using Stellarium. The Moon will be in the last quarter phase on the 1st, new on the 7th, first quarter on the 14th and full on the 23rd. On the 14th, the Moon will occult the star 50 Sagittarii at around 8:10pm for northern observers. The middle of the month sees the start of the Orionid meteor shower, which will peak on the 21st. Peak rates are low and a full Moon will blot out all but the brightest. Orionids are fast and leave persistent trails. They are best seen before dawn. Heavens above presently lists two comets above magnitude 12 and seven asteroids above magnitude 10 in the hours of darkness. The comets are: 103P Hartley at 5.6 – approaching visibility – in Cassiopeia and 10P Tempel 2 at 10.1 in Cetus. Details on the future movements and changing brightness of the comets can be found here. The asteroids are 6 Hebe at 7.8 in Cetus; 4 Vesta at 7.9 in Virgo; 8 Flora at 8.6 in Aquarius; 1 Ceres at 8.9 in Sagittarius; 7 Iris at 9.4 in Gemini; 39 Laetitia at 9.5 in Aquarius and 471 Papagena at 9.8 in Cetus – rather a busy constellation this month. 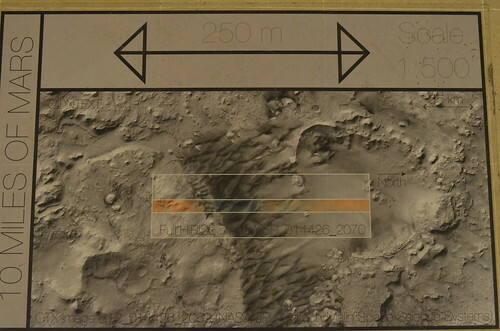 Mars is usually lost in atmospheric haze now. It shines at +1.5, appearing in the south-west, only to set an hour after the Sun. Venus is seen just below Mars as the Sun sets, shining much brighter, but also lower, requiring a very low horizon to the West to see it. Mercury for the next day or two, Mercury is visible in the Eastern horizon shortly before the Sun rises, though it will appear dimmer than its +1.3 magnitude suggests due to the bright sky around it. Saturn returns to the skies at the end of the month, making an appearance shortly before dawn with rings now angled such that they look more like rings. The planet will shine at a magnitude of 0.7. Jupiter continues to shine brightly as ‘that star in the East’. It shines at a magnitude of -2.9 and is in an empty part of the sky. Its inclination is such that transits of satellites happen quite a bit. Times of some of these and appearances of the Great Red Spot are here. Uranus lies a couple of degrees west of Jupiter, plus a little above, and shines at 5.7. Neptune is also in the morning skies, on the border of Capricorn and Aquarius. 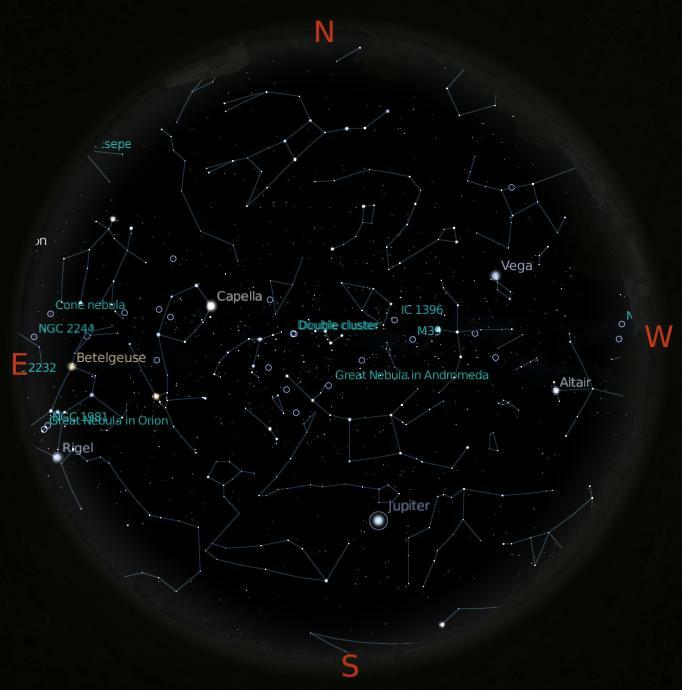 The constellations of Leo, Virgo and the Big Dipper are all home to galaxies, details here. This is not a good month to look at faint things as the all-night twilight obliterates detail and contrast. If you want to watch satellites flaring or passing in the sky (even sometimes during the day), then go to Heavens Above to get times and directions. If you need assistance in deciding where things are in the sky, why not install the free program Stellarium, which does all the work for you? Finally, to avoid the dreaded clouds, Met Check gives a quick forecast and the Met satellites or other satellites can be used to track breaks in the cloud. For an indication of auroral or solar activity, SpaceWeather.com is an invaluable resource. If the stars aren’t available, there’s always solar astronomy. Projections of the Sun onto white card can show sunspots, when properly focused. A good filter (not an eyepiece filter) or a dedicated solar telescope will show better details. Never observe the Sun without filters and never with an inadequate, inappropriate or old (and therefore possibly with holes in) filter. 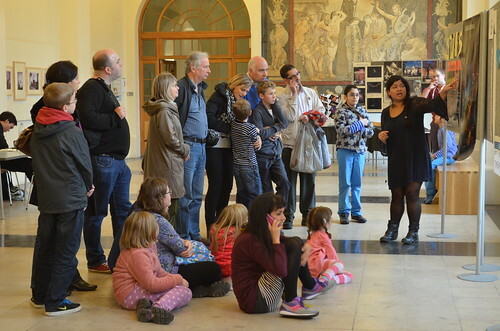 For young astronomers (ages 9-16) Space Explorers is run in Kendal Museum on the third Saturday of most months from 2:30-4:00 pm. The next meeting is on Saturday the 23rd. The Society for Popular Astronomy also has a sky map for young astronomers here. Plus why not pop along to the Eddington Society, which meets at Kendal Museum on the first Monday of each month, this month it is on the 4th, with member’s projects the subject of the meeting. There will also be a public observing event at The Brewery Arts Centre on the 15th from 6:30pm. 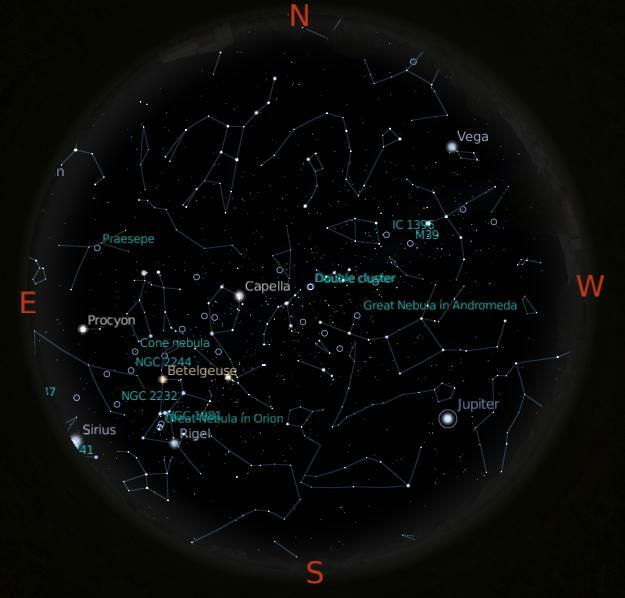 Don’t forget to check back here and on my twitter account for the latest astronomical events in this area.